THIS LISTING IS FOR A DIGITAL BIRTHDAY INVITATION. No Physical product will be shipped. This is a digital invitation that we will customize the text for you. You can print it at home or send to stample or similar place for printing. 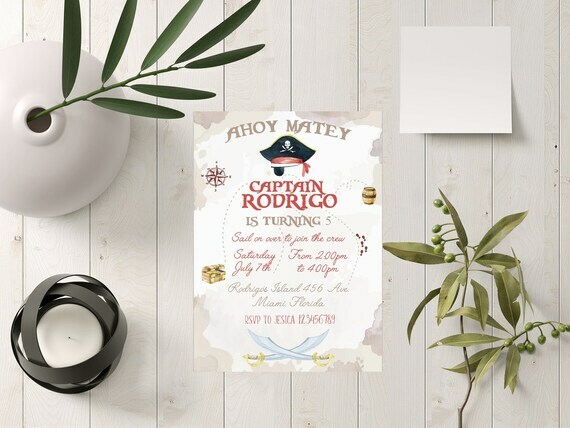 The invite size is 5x7 (you can ask for another size) and will be sent in a A4 paper size (2 invites per A4 ) PDF file (to be opened only with acrobat reader ONLY), ready for printing. Also you will receive a digital invitation that you can send via whatsapp or mail. Once we receive the information for the invitation, it will be sent within 24 hours. If the purchase is on a Friday, it will be sent on Monday. -Because it can be a difference in monotor/printer colour calibration, the colours of your print may be slightly different that's why we offer RGB and CMYK color formats so you have the chance to see which one looks better for you. All sales are final as this is a digital product. We do not accept refunds or cancellations. Invite can only be opened with Adobe PDF "READER" on your computer (PC or Mac ONLY). By purchasing this item you agree to these terms. This item can not be re-sold or modify in any way.